Barkha Dutt could have made a very good banker had she not joined journalism for a living. Because for me, I haven’t seen a better banker than her who cares for the profit-loss statement, both for herself and the organization she is associated with; even if that means spewing outright venom of lies on daily, err.. hourly basis. Not only shouting lies but the manner in which she gives her everything to convince the nation to go by what she says on her programs can even give some serious complex to the likes of people whom we better refer by ‘Credit card selling touts’. Not to malign the ‘Credit card selling touts’ entirely, they are honest at times with few of their commitments but not Barkha Dutt. One of such truth defying spectacle came from her in the last edition of ‘We The People’ yesterday. Honestly, I love this program for the topics that are generally discussed in it. Though each time there is a topic that involves Hindus, Hindutwa, Hindu centric organizations or even BJP, the discussion looks more fabricated and prejudiced than otherwise but I still love to hear the pseudo seculars getting hypocritical as per the expected lines. Or maybe the lines that Barkha and her team of cronies want to run to appease their pay masters and political bosses. No marks for guessing who the supposed political bosses of NDTV are. The topic that was discussed yesterday in WTP was one such topic that involves the presence of Hindu terror. Even if such topics are juicy and interesting to say the least, I for an audience could have done without one more since Barkha might have discussed on this topic on the very program, close to a zillion times. ‘Is Saffron Terror A Reality’, she asked on top her voice to start with. As far as difference with her previous episodes relating to the very topic is concerned, I didn’t find any difference. Same kind of panelists full of pseudo seculars with a very thin presence of individuals to talk on behalf of the Hindus, a retired police officer who could be mistaken as the perpetual spokesperson of the department altogether and of course someone from the minorities to open his mouth and orate the standard lines on how he has to suffer because he is a Muslim. And here I don’t understand why they call Chandan Mitra to talk on behalf of the BJP again and again. I am not sure if Mr. Mitra needs permission from BJP headquarters before attending any such programs but if at all he is, then BJP must rethink about giving this man the permission next time. I am not questioning Mr. Mitra’s loyalty for BJP but he is doing more damage to the party than clarifying their stand on issues involving BJP directly or indirectly. Rajiv Pratap Rudy could be a better bet any day and seasoned storytellers like Barkha must realize this if she is really serious about having a full throttle discussion. Back to the topic. Well for me there isn’t any topic on what Barkha wanted a whole lot of people to discuss and debate. As rightly pointed out by Mr. Mitra and the retired cop, there could be nothing as ‘Saffron Terror’. I am convinced with this conclusion as much as Barkha herself got convinced with a lady from the Muslim community who opposed the ideology of Abinav Bharat’s spokesperson who claimed his organization’s motto is to have a Hindu Rashtra. 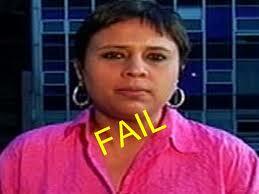 Here is the first biased blooper from Barkha. She being a human has a right to have opinions but not certainly when she anchors a show that debates on a very, very sensitive issue. When an anchor stands beside an orator and openly takes sides on what she said; it only shows that the idea of arranging the debate is not to have a healthy discussion but to push the agendas that her paymasters wanted her to. She didn’t stop there. For all those who were speaking on affirmative on the existence of Hindutwa terror, they had Barkha standing side by them to stamp their claims. Not only taking sides, but she also was seen even opposing what Chandan Mitra and the councilor of Colonel Purohit has to say. Could someone please educate this Padma Bhusan awardee that the job of the anchor is to conduct a smooth debate, not to get involved in them with your own prejudice, self-gain, sycophancy or whatever. If at all she can’t just resist pushing her own lies, she could have asked anyone else from her channel to conduct the show while she herself got into the panelist’s chair as most of the other biased and paid speakers were. Another blooper she did when she thought of including a guy called Imran, who she claimed was one of the hundreds who were wrongly picked up by the police after the Hyderabad blasts. Now here is the thing. In fact couple of things. First, tell me one such organization or individual that hasn’t done a mistake ever. Mistakes are part of day-to-day activities. Didn’t Barkha herself admitted to have done a mistake in believing a woman who was nothing but a high level power broker when the rot of Radia tapes started to dip on her face? Didn’t even the party to which she shows her equivocal loyalty done mistakes after mistakes? Then why she is pointing out the police in each of her programs involving the Muslims? Aren’t the police allowed a mistake or two at times? I agree the mistakes in case of Imran and his friends were monumental and life shattering but does such fringe incidents really puts a question mark, the way Barkha wanted to convey, on our anti-terror investigations altogether? Popping the topic of illegal detention in Hyderabad or the unsubstantiated ones in Kashmir, every time one raises the issue of terrorism only demoralizes our security forces which already have accepted their faults quite openly. When Barkha herself gets annoyed and threatens with legal actions on anyone who dares to mention the Radia Tapes, then why can’t see realize the amount of annoyance our men in uniform must be going through for the repeated mentions of one mistake by morons every day? Second, our investigating authorities or for that matter any agency across the globe, most of the times work on perception. When I say this, I do with some conviction. This is only perception that pushes our police forces to round up the notorious thieves of the area whenever a case of theft is reported. This is a routine first step in any criminal investigation. So people like Imran, how aggrieved they may be must first look within before blaming the police forces. I still remember when I and a friend of mine who happens to be a Muslim were travelling to USA. During a stopover at Heathrow, he was pulled inside a closed area for a strip search while I was allowed to go through after a simple metal detector and physical scanning. He didn’t blame the Heathrow authorities for such discrimination but few rascals from his own community. My friend has got nothing to do with terror or terrorism; he yet has to go under a special scrutiny. Why? Because the chaps at the London airport work under a perception. And the perception, whether we like to admit or not is – ‘paint all Muslims through the terrorism brush until swayed otherwise’. Who the real culprits for such skewed perception? Yes, not those who guard the gates at Heathrow but the scoundrels who are spreading the language of terror throughout the world. They are the bastards who should be blamed for such discrimination as rightly done by my friend. Like my friend, Imran and his associates are a causality of a similar perception. The real culprit here is not the Hyderabad police but the bots who teach hatred as part of their daily curriculum. It is not the SHO of a particular outpost who is answerable but the Mullahs who run the breeding grounds of terror in their own backyards. People like Imran will continue to suffer the wrong way as long as none at some point tries to change this very perception. While I could show empathy for Imran and many like him, I certainly can’t brandish our security forces as idiots for the mess since it is the few from the community to which the Imrans, Salims, Javeds, Sarfarazs of the world belong who are responsible for this miscarriage of justice and violation of fundamental rights of the Muslim youth. But could Barkha see these facts through her prism of hypocrisy and lies? For her, terror acts perpetrated by Jehadi terrorists on routine basis could be overlooked but not the fringe incidents where Hindus were found involved. Here even terming involved is an exaggeration since none is yet convicted in any of the alleged crimes but hundreds from the other religion rotting behind bars after conviction carry no sense of urgency for her. Imrans of the world are a burning issue but not the hundreds of innocents who lost their lives during 26/11 or elsewhere. Digvijay Singh going to Ajamgarh and cajoling the terrorists is nothing compared to the remote association of Colonel Purohit with RSS. Akbaruddin Owaisi claiming to wipeout Hindus in 15 minutes is secular but Abhinav Bharat having an ideology of a Hindu Rashtra is thoroughly communal and worth lambasting daily. This is where I feel the banker inside her is dying to come out. I call banker because this is where she sees her interest and this is where she finds her principal safe. Castigating Hindus and all possible Hindu associations is a long term investment for her and the media house she belongs since that is where they are going to get their next pay cheque. A true banker who only sees her own interest. Sentiments, moral, the customer (read the viewer) or for that matter the nation can go to hell for all that she cares but indigenous interest must not get hampered; even if that means, as I said earlier, vomiting lies without even blinking the eyelids. she is fraud like her medai house..Entire nation knows it. its fashion for all frauds, to take for fake secualrism..to cover their frauds. Burqa is a hi paid employee of filthily corrupt Khangrass party since 10yrs. If CBI did perfect probe of 2G, she should have been behind bars for liasing between crooked minister, Page 3 pros and a cheater biz head.... she is just aged class whore. Just one question. Why does BJP agree to participate in NDTV debates ? I was pissed off to watch that show. People like her live in a denial about Islamic terrorism. It is a mental disease with all leftist liberals. They will criticize Hinduism and Christianity (in the west), but when it comes to Islam, they will crawl under a stone. I like your articles. I have seen few spelling mistakes and also some grammatical mistakes in your current article as well as your other articles. It may be due to oversight but these types of errors can be fixed very easily. Please do not misunderstand. We need someone like yourself to stand up and expose these liars. I believe Hindus were finally liberated on 16 May 2014. Hindus should celebrate 16 May 2014 as their independence day. I wish journos like Barkha, Rajdeep, Sagarika Ghosh, Nidhi Razdan and that Idiot Karan Thapar should be sent on a spacecraft like Voyager, never to return to earth.